Total joint support. Rehydrates your joints. 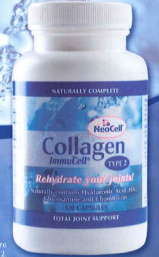 Contains a natural blend of Chicken Collagen Type 2 Protein, Hyaluronic Acid, Glucosamine and Chondroitin. 120 capsules per bottle. Serving size: 4 capsules daily. Kolla2 (R) chicken sternal cartilage 2,400 mg per serving. Other ingredients: Kosher gelatine capsule. Contains NO SUCROSE, STARCH, YEAST, WHEAT, CORN, CHOLESTEROL OR DAIRY PRODUCTS.